The storied chef reflects on what it took to finally make money in the restaurant industry, and the new obstacles cooks face today. 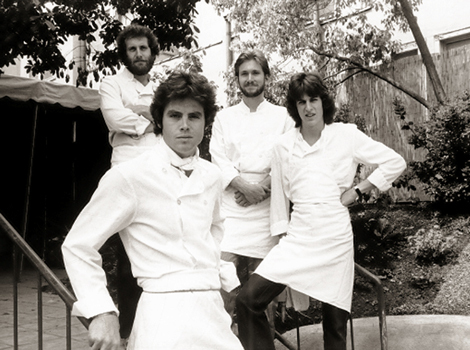 When chef Jonathan Waxman left California for NYC in 1984, he considered himself a “lone wolf.” Blame the outsider status on Jams, where Waxman ushered in a new paradigm of dining in the nation’s culinary capital. Characterized by seasonal-driven menus in a casual, but elegant setting, the restaurant channeled a vision that took root at his alma mater, Chez Panisse, back in Berkeley. 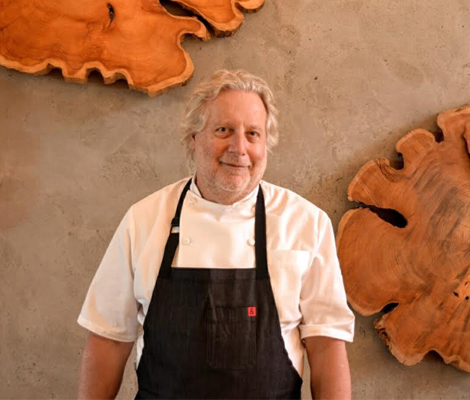 With the opening of Waxman’s in San Francisco’s highly-trafficked Ghirardelli Square, the chef continues a storied career that has allowed him to explore restaurants in all their iterations. We caught up with the elder statesmen of NY food to talk about cementing a legacy based on chicken, the perils of restaurant culture in NYC, and the key decision that allowed him to finally make a profit. On what it means to have a legacy defined by roast chicken, and the complications of perfecting it. 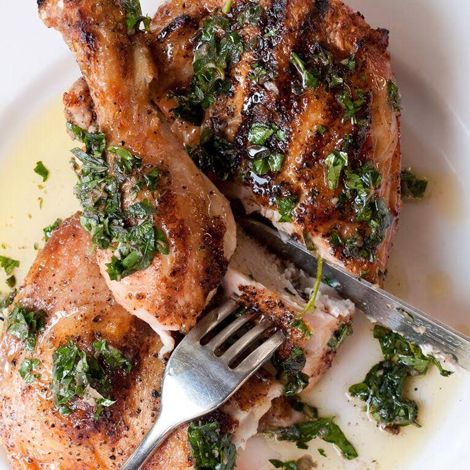 This is the funny thing—everybody calls it roast chicken, but it’s kind of roasted and grilled at the same time. It’s a hybrid cooking process. Judy Rodgers at Zuni Cafe in SF roasted hers whole. My chicken is half. We start it in a wood-burning oven, and we finish it on the grill. Everybody says it’s easy, but it isn’t. When I was in Michael’s in Santa Monica, we grilled chicken in a French style. You debone the chicken, then you cook it on the skin side very slowly over the grill until all the fat starts boiling under the skin. Then the skin turns crispy. Then when I opened up Barbuto in NYC, I said, you know what? I don’t want to take out the bones anymore. We figured out how to start it in the oven and finish it on the grill. It rests in between. Every bird is different. The oven is different everyday. It’s a complete nightmare. Then you pull them out, let them rest, and then you grill it again so the skin gets a second crispness to it via the grill. That’s what separates my chicken from other people’s chicken. On whether NYC is experiencing a culinary brain drain due to exorbitant business costs. In New York you are saddled with rents that are out of control. The cost of doing business is just daunting, to a point where I think the whole mechanics of New York will have to change before independent operators will be able to function here. It’s just too expensive. Honestly, the only thing that can be done, and I hate to say this, is that people will need to pay more money for food. There’s just no other way to do it. We’ve tried to keep prices down forever. It’s like with San Francisco—the minimum wage goes to $15, there’s got to be a quid pro quo. What’s going to happen? You can’t keep the price the same, otherwise it just won’t be profitable and you will go out of business. It’s a simple equation. Sydney, Australia has tackled this. Melbourne too. They have their own issues, of course. But I think that is the biggest problem now. Everyone should have a living wage. I don’t want to have a dishwasher that can’t afford to work in my restaurant. So how do you make it viable? You do more volume or you could raise the prices. There’s a lot of small restaurants in NYC, though. Unless you are Mario Batali or someone else who is full everyday of the year, most restaurants need to figure out a strategy. I don’t know what else to say. You can pinch the cost until everybody hurts so badly that your staff feels it and they are unhappy. There’s got to be a balance point. Everyone is afraid of it, but that is the big grill of the room. On the cooks of today, and the new obstacles they face. Most of the cooks I grew up with didn’t start off as cooks. They went to school to be a math teacher or musician or artist or whatever. They changed careers mid stream. Now you have a lot of people who enter into things at an earlier age. I love these new cooks. They are much better educated about food than I ever was when I started off. There’s so much more available in terms of TV shows and books and magazines. You walk into Whole Foods, for instance, and just walk around, just look at all the ingredients. It’s exciting, but it’s also daunting too because you have to start making choices. What’s my style? Where am I going to work? How am I going to do it? So what I tell people is map it out. Spend a year at a place. If you like it, spend another year. But don’t spend too long. Try to move around. The whole apprenticeship style system that they have in Europe I think is the best thing. Then you start figuring out who you are as an individual. What do you gravitate towards? What do you like better? That’s the difficult for a young cook. You look at someone like Mario Batali and are like, “How do I turn into him?” You can’t. You’ve just got to turn into yourself. That’s the most important thing to think about. On dropping one’s ego to make money. I worked a little bit in the front of the house and the back of the house. That was super important for me. To be stuck in just the mold of cook, that’s pretty difficult. I think you need to see the perspective from both sides. To me, I love chefs that are interested in wine and beverage programs, how the customer thinks about food from a waiter’s point of view. To become a restauranteur you have to see all points. You have to see all points on the horizon. You have to stand on top of the restaurant and look down upon it. If you just do it from a cook’s perspective, it’s myopic. You are only seeing 40% of the puzzle. I never really made money in the restaurant business for 35 years until Barbuto. I was much more interested in, and I hate to say it, my own ego and doing what I thought people wanted, which was an expensive place with expensive silverware and a huge wine list. Those restaurants are very difficult to make money in. Then when I opened Barbuto I threw away all the nonsense. I threw away the tablecloths. I had one wine glass, one water glass. I threw away all the spare parts I knew I didn’t need, and decided to have three or four people in the kitchen. Guess what? I started making money. It’s funny, right? I had to learn the hard way. I had to learn that if you want to maintain a $4,000 bottle wine list, you have to x number of sommeliers. It’s so hard. I didn’t want that anymore. I wanted to be light on my feet. I honestly didn’t think it was going to work. I didn’t have an entree over $19 and all my friends were pissed off at me because they were charging more than I was. I said, look guys, I’d rather go for a little more volume and make everybody happy. Do it real bare bones. It worked from the bottom line and we started making money from day one. On how to retire in the restaurant industry. One thing that I’ve discussed with my partner is the fact that we want to create our own demise. If we can build our restaurant group into something that’s viable and it works well, then we start putting the key people as our partners, and as the years go by we surrender our equity and they take over the business. I think that’s the beauty of how it should be. There will be a retirement at the end of the day for me because I’m not going to be able to keep growing for another 10 years. But let’s face it. Most restaurants don’t last more than 10 years. That’s just a problem.